Payment technologies that safeguard financial data change quickly in response to ever-evolving threats. 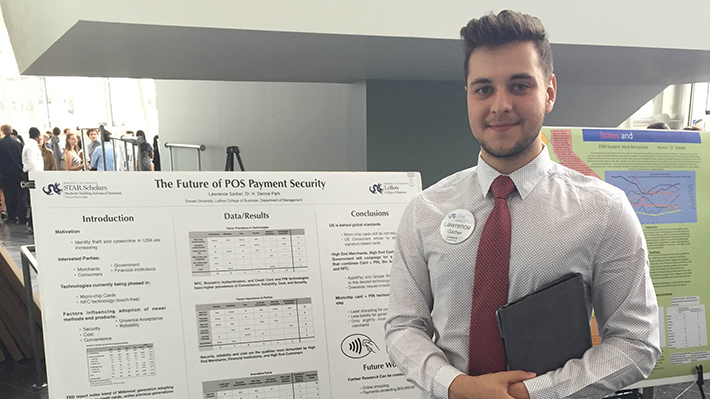 Projecting how we’ll pay for retail items in five to ten years is a difficult task, but that’s what Drexel LeBow freshman Lawrence Garber spent his summer trying to decipher. As a participant in the STAR Scholars research program, Garber reviewed available literature under the guidance of assistant professor of management H. Dennis Park. What he found is that the adoption of new payment technologies is greatly influenced by national laws, consumer attitudes and merchant liability. In many ways, Americans can glimpse the future of payment by looking to Europe, Garber says. In the United States, liability for losses due to stolen credit cards or financial data has usually remained with the government and financial institutions. In Europe, much of that responsibility is placed on the merchant and consumer. The result, according to Garber’s findings, is faster adoption of new payment technologies that do a better job of securing data and stopping fraud. One of those technologies is the microchip credit card. This type of card has recently become available in the United States, but has long been the standard elsewhere. Garber found that the combination of the microchip, which encrypts the users’ account information, and a pin number, is the most secure current option for users of physical credit cards. With financial institutions in the United States already trying to shift some liability to consumers and merchants, microchip cards are likely to become ubiquitous. However, Lawrence found that an even more secure option is already emerging. Digital payment systems such as Apple Pay and Google Wallet make use of advanced encryption to keep their information secure and require fingerprint authentication. That combination is superior even to a chip and pin, but all-digital systems are limited by their availability. Not all merchants accept digital payment and consumers can’t gain access without an up to date smartphone. Digital payment looks to be the way of the future, but Lawrence cautions that it can be hard to predict. Many said cash would be fading by now, but hard currency is stubbornly hanging on. Garber notes that new laws and policies can abruptly change the financial landscape. “What I found is that if costs are put on the merchant, they’re most likely to be the drivers of change,” Lawrence says. And with financial institutions currently seeking to place more liability on merchants, it’s possible that we’ll see advanced payment systems sooner than later.